Three advertisements from the same company, all with the same concept in mind. Each billboard has the same base concept of a vacuum cleaner. Where it goes above and beyond, is what the vacuum cleaner is pulling in. In the first one, it is pulling a helicopter into its opening. The second one, it is pulling a satellite into itself. The third one, the vacuum is pulling a hot air balloon down into its depths. The overlapping aspect of these vacuum cleaners? They are all the same vacuum cleaner, all from the same brand: Miele Vacuum Cleaner. Obviously, the underlying message of all three of these ads is the fact that this is one super strong vacuum cleaner that can pick up just about anything. Don’t believe it? Well, here are images of it pulling in a satellite, hot air balloon, and helicopter. I feel like the goal is to amaze the viewer with how strong and powerful this particular vacuum cleaner is. What better way to show that than by having it “pull” these mighty objects straight out of the sky. I believe the objective of this campaign is to sway the viewer towards purchasing a Miele Vacuum Cleaner for themselves. The target market is anyone in the need of a vacuum cleaner. Whether that is someone looking to purchase their very first vacuum cleaner, someone looking to replace a crummy vacuum cleaner, someone running a cleaning business and needs a good, reliable vacuum cleaner, someone who owns any kind of business (i.e. office building, school, hotel, etc. ), anything with a housekeeping type department. This would be a vacuum for you to purchase. If the viewer goes through with purchasing one of these vacuum cleaners, they will not regret it because they will have purchased the most powerful vacuum cleaners on the market. The caption of this image/billboard reads, “Found on Redondo Beach. August 21, 2005.” All the way to the bottom right of this image is a link for the Surfrider Foundation, which is a non-profit that strives to protect every aspect of the oceans, whether that is with beaches, waves, etc. 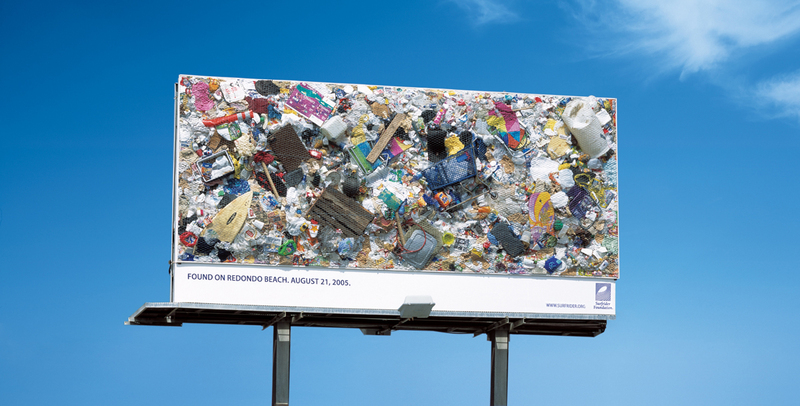 The overall image of this billboard is all trash; trash that was found all over Redondo Beach. The image is meant to shock and startle people into realizing that all of this awful trash, was found all over, what is supposed to be, a beautiful beach. At a quick glance, one can see: a boogie board, a wooden pallet, a shopping cart, at least two beach chairs, lots of plastic bags, laundry detergent bottles, and there’s so much more. I feel that the objective of this advertisement was to draw the public’s attention to a huge issue that needs to be addressed. Rather than the ad just saying, “Littering is bad! Don’t do it.” Instead, they show an image of the problem, they state where and when it was taken, and then they provide the link and a name for a group that is striving to solve the problem. Anyone that has the capabilities to get involved and/or spreading the word about the need for help and dealing with the issue of polluting our beaches. Beaches tend to be some of the biggest vacation areas. Everyone has their place that they generally end up going to enjoy over the summer or for their vacations. I know my family is one for going to the beach for a week over the summer. One of the biggest things I feel that tourists overlook when it comes to their vacationing is: One, yes you are on vacation, but people do live here on a regular basis, too. Two, a beach is not like your hotel room or beach rental, there aren’t people that come in at the end of each day/week to make sure things are spick and span for the next day and/or the next people. Three, if no one took care of their trash, our beaches and oceans would pretty much just be like landfills, the biggest difference is that the beaches were originally vacation destinations. The reasons for this advertisement is to make people care and strive to get individuals involved. The image and message are fairly simple and straightforward. The image is of the framework of, what would be, a billboard. There is a small sign in the bottom right of the billboard with a short message from WWF that reads, “Plant more trees.” Beyond just the small sign with a message, is the open framework of the billboard structure. All that is within this open framework, outside of the metal that makes it, are bird nests. At least seven can be seen, whether they’re currently in use, that doesn’t matter. The message and concept are clear, we need to plant more trees, that way there will be more throughout our community, country, and the world, that way birds won’t have to make use of unnatural structures that may or may not be safe for their homes. I feel that this ad strives to shock and impose the feeling of the threat that the environment is facing. The goal of this advertisement/campaign is to convince viewers that trees are an important aspect of our world and we need to plant more, that way the birds will have options beyond just scary metal structures. I feel that, even if this ad were just for a little while, the overall issue could always be addressed. The target market, honestly, is anyone that has the ability to plant a tree. Granted, I believe this ad may have only been in India, but that is okay. At least it was somewhere. This advertisement wants the viewer to take the action of making a difference in their environment, by adding more trees to the natural surroundings of their country. By helping the flora, they will greatly help the fauna. Hyper is made up of four images, though the actual billboard generally looks similar to the top image. The billboard was set up with an engine on the back of it, right about in the center, and they set it to rotate the image of a dog chasing its tail. With the engine being on the back of the billboard, the dog is always spinning, giving the impression that the dog is always running in circles. The constant spinning reflects that this is a dog that has constant energy. In the bottom right corner is an image of a bag of Pedigree Dog Food. There is text underneath the dog, unfortunately, it is too small for me to read, but one can assume it reflects that Pedigree High-Performance Dog Food is the best food for any dog that is high in energy. I think this advertisement is meant to be seen as humorous and amusing. Anyone that has ever known a dog, had a dog or really seen a show/movie/YouTube video with a dog can understand how absolutely ridiculous dogs can be. I feel many can relate to that absolute silliness that is a dog. So, seeing this billboard is meant to make you laugh, but then also think about possibly purchasing Pedigree High-Performance Dog Food for that dog that you have in your life that is absolutely insane and could use some more suitable food. The target market for this specific advertisement, I feel, is dog owners, dog lovers, dog rescuers, dog fosters, dog anything. Basically, if you love the high energy dogs in your life, you should purchase them Pedigree High-Performance Dog Food. Obviously, your dog will benefit from this dog food if you were to purchase it for them. I feel that the concept of being able to relate to the advertisement is one of the biggest reasons people would find this ad amusing and be interested in purchasing this product. This advertisement is designed to kind of be like a kid’s toy/game. There are two slotted tracks that are mirror images of each other. Then there is one car set to run the tracks. Obviously, the car isn’t the actual size of a Mini Cooper, but it is pretty much like a scale model of one. This Mini is set to “run” the track. MINI is known for making smaller, reliable, strategic and slick cars. So setting this billboard up in this manner, I feel like, reflects how awesome these cars are. How tight the tracks are, shows how quick and responsive these cars are. Due to the way this billboard is set up, I feel the viewer is meant to find it cute and funny. There might be some nostalgia thrown in there due to the potential memories the viewer(s) may have from growing up, playing with toy cars on a toy track of some sort. This ad, I feel like, is meant to show off how tiny and slick Mini Coopers are. At the same time, by depicting the potential nostalgia of it all, maybe someone will consider purchasing one for themselves. The target market would be anyone looking into buying a new car for themselves. That, or anyone considering switching from the current brand of car that they have at that time. The viewer will benefit from purchasing themselves a Mini Cooper by making them the best with maneuvering on the road. The image itself is extremely simple, in my opinion. It is all pretty much the same color: lots of red. There is a tool box that is sitting completely wide open. Normally, most tool boxes have lots of stuff in them, random stuff. But not this one, all it has one item: a Victorinox Swiss Army Knife. It seems kind of silly, but the entire message is: all you really need is this one tool. This Victorinox Swiss Army Knife is the best tool you could ever have in your life. Simple, but the message is very strong. My initial reaction to the simplicity of this ad is, it makes me smirk. I guess the word would be amusement, not really astonishment. The simplicity amuses me, but I do agree with it fairly well. The Swiss Army Knife brand has definitely carried a reputation of being one of the best. The goal of this campaign is to convince the viewer that, when considering purchasing a pocket/utility knife, the Victorinox Swiss Army Knife would be the best way for any individual to go. The target market would be anyone in need of a do-all sort of tool to use in their life. The ad wants the viewer to consider having a Victorinox Swiss Army Knife of their own. All of these ads and others were done by Dove. All of them feature different people. With all of them, there is something about them that may not be seen as beautiful, whether it is wrinkles, gray hair, lots of freckles, or whatever else society has taught us to view as “imperfections.” The first image is of an older woman with many wrinkles. The second image is another older woman, who has a head of long gray hair. The third image is of a younger woman who has freckles all over her body. 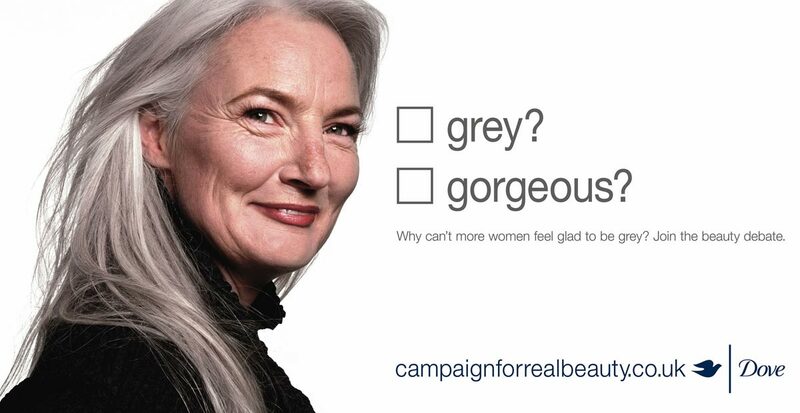 These images were all a part of a campaign in the U.K. called, the Campaign for Real Beauty. They are wanting to define beauty, real beauty, as more than just “perfect” skin and “perfect” features. Beauty is in everything and they want people to know that beauty can be accentuated by using their Dove products. I feel like they want to impress and influence others to start rethinking how they view a person’s beauty. The objective of these advertisements is to get people on board with a Campaign for Real Beauty, trying to break out of the standards of beauty that society has created. The target market for this campaign, honestly, is people; the human race; the population at large. Beauty knows no bounds and they want everyone to break out of the barriers that society has set, to acknowledge the fact that there is no one kind of beautiful. They want people to look into their campaign and understand it all more. This ad is made up primarily of a woman’s face done in Roy Lichtenstein’s pop art. In the top left corner is a small image of the product being advertised, which is Clear Pore Strips. The significance of any of this is Roy Lichtenstein was known for having images loaded with dots. The woman’s skin is covered in these dots, except for a section of her nose which is the point of this ad. Clear Pore Strips will clear out your pores extremely well, don’t believe it, just look at this Lichtenstein style painting! It did an amazing job for her, so it will for you, too. The purpose of this advertisement is to wow and astonish anyone that has concerns over their pores being clogged or “nasty” in any way. Their goal for this advertisement was to convince viewers that this product is really worth purchasing because it will help so much with your pores. The target market for this ad, I believe, is anyone that is unhappy with the way the pores on their face are. The ad wants the viewer to consider purchasing their product for the benefit of having a clearer looking face. My cranium is splintering from the remorseless reverberations of nursery rhymes. The mindless chanting of alphabets has hemorrhaged my cerebral cortex and diminished my intelligence quotient severely. I beseech you to excuse me for the day before I degenerate into a Neanderthal like you. The text above is what can be read for this advertisement. It is written with Scrabble tiles/Mattel blocks and is meant to be a young student to a teacher. It is left open-ended as to which teacher exactly it is for, but it is from ‘Dennis’. Essentially, the letter is asking the teacher to forgive them for not wanting to participate in nursery rhymes due to them being trivial, simple, and repetitive in nature. Their wording goes beyond the word structure of the average nursery rhyme. They want to be treated as more mature than they are perceived to be at the age they’re presumably at. Through this advertisement, they most likely wanted to achieve some humor through the words and phrasing of the note from the child, Dennis. We tend to not view children as capable of articulating such large words and phrases. So by articulating it through Scrabble tiles/Mattel blocks, it reflects the age of the child and shows just how intelligent Dennis really is. Through this advertisement, they want people to realize that Mattel blocks and Scrabble are extremely useful to any family, child, person, whoever because it will help you better articulate what you want to say in a much more intellectual manner. The ad wants the viewer to buy this product, whether it be Mattel blocks or a game of Scrabble. Obviously, if you have either of these, you and your child will grow in your ability to spell and utilize larger words than before. At the bottom of this image is the quote, “Need to lose a little weight before your wedding?” and it is right next to a tiny image of a can of Slim-Fast. The overall image is the top tier of a wedding cake with the two figurines. The groom is holding the bride in his arms and, unfortunately, his feet have sunken into that very top tier of the cake. So, obviously, he is struggling to handle his bride’s weight. I believe the goal for this ad is to strike humor and, maybe, a little shock within the viewer. This ad came out in 2001, which makes some sense. Our society will still choose to make some plays on weight here and there, but with how times have changed, it has become fairly frowned upon. Body positivity has become a very significant thing in our current society. Anyways, the point of the humor was saying in the playful sense of, “Maybe the bride should have taken on drinking Slim-Fast before the big wedding day.” Hitting people with the idea of not being “perfect” on their “big day” which will, hopefully, make them pursue purchasing Slim-Fast and bettering themselves. The target market for this advertisement is, honestly, anyone that feels like they could use dropping some weight, regardless of the reason (i.e. wedding, beach body, job interview, etc.). The advertisement wants the viewer to consider purchasing Slim-Fast, whether it’s for them or for someone else that they know. This ad depicts the Guinness Toucan proudly displaying a glass of, what one can presume to be, Guinness beer. The Toucan sits atop a weather vane, which is shown to be way above a town. In the sky, above the Toucan’s head, is the text in bold red, “Lovely way to SHOW OFF your brand.” This particular ad is part of a campaign which was done by the Newspaper Marketing Agency. These ads are classics, which are being used to make the argument that these older brands continue to use newspaper ads and marketing successfully and you can too, by looking into the Newspaper Marketing Agency. I mean, there is obviously a science to it all if these brands have been able to make newspapers work for them so very well. There is a blurb of text to the right of the Toucan that reads, “Newspaper advertising. For over 75 years Guinness have used this powerful medium to gain a greater share of voice and stand out in their market.” I feel, by using older ads, part of the goal is to create a feel of nostalgia within any readers because of how classic the overall appearance is. The goal of this campaign was to have a series of different ads, a total of six, to be used to show how successful newspaper advertising has been used throughout the decades and to get people interested in continuing to use this venue for advertising for their own purposes, so they should consider using the Newspaper Marketing Agency for assistance. It is to show that the old advertising markets are still viable and beneficial. Obviously so, considering these older brands still continue to use and see value in newspaper ads. I believe these ads ran for a couple of months, though choosing to use the Newspaper Marketing Agency is always an option, regardless of the ads still running. The target market for this advertisement is any business or individual(s) seeking avenues for marketing themselves. Whether it be a product, a service, etc., it does not matter because the timelessness and benefit of these ads far exceed anything. This ad wants the viewer to consider contacting and working with the Newspaper Marketing Agency for creating advertisements for their product or business. The viewer will benefit from this action because they will benefit from this advertising venue because these super successful and larger companies have done so well and obviously still see value in it due to their continued use. The complete image of this advertisement is an older Volkswagon Beetle. 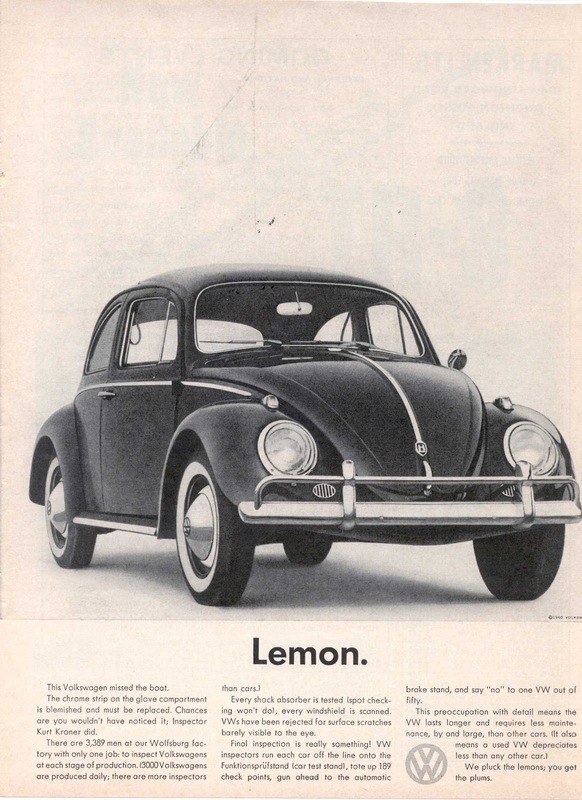 Below the image is a segment of text, the title being “Lemon.” Then it proceeds to state that, “This Volkswagen missed the boat. The chrome strip on the glove compartment is blemished and must be replaced. Chances are you wouldn’t have noticed it; Inspector Kurt Kroner did.” The advertisement continues on to talk about how, “there are 3,389 men,” that work their Wolfsburg factory that are all there for the single purpose of inspecting each and every vehicle at every stage in the production process at this location. They also produce 3,000 vehicles at this particular location on a daily basis and mention how they have more inspectors than vehicles at one time. They continue on to talk about how every aspect is tested and if a standard is not met, then the car is sent back to be worked on until it meets that standard. They finish the advertisement by stating, “We pluck the lemons; you get the plums.” Meaning that they pull the “sour” ones and they make sure you get the nice, sweet ones that are ready to go for you. This, I believe, is the original ad that was published during 1959. It is also one that the Newspaper Marketing Agency chose to include in their campaign, though this is not their exact ad. The goal of this advertisement was to intrigue the viewer/reader into wanting to purchase a Volkswagon due to the manufacturer’s dedication to providing the best quality product and how it is meant to last a good long while. They wanted to get the viewer to have a better understanding of their process, that way an appreciation may be developed. The target market, I believe, would be anyone of the car driving age or that can afford to buy a car. Someone that needs a new car and is looking to switch brands in the hopes of finding something more reliable. The ad wants the viewer to consider purchasing a “plum” from them because they make sure the buyer isn’t getting any “lemons” and knows that it is a quality product that they will not regret. By expressing to the viewer that there are more inspectors in a Volkswagon factory than there are cars produced in a day, that means that there should be no “lemons” coming out of their production and you will always end up with a quality piece of machinery. I chose to focus on a series of four ads for my first one for the Newspaper Ads. Why? because how can I analyze just one of these four, when they are essentially a series. Throughout all four ads, it is the same man. First, he looks like a normal individual. The second ad, he has a black eye and it is swollen shut. By the third ad he’s smiling, revealing that, not only does he have a black eye, he also is missing quite a few teeth. The final ad, the fourth one, he’s missing another tooth and his ears are sticking out and look slightly torn. The caption below all of them says, “Nobody gets closer to World Cup Rugby.” This ad reflects that this particular rugby team in New Zealand is tough and extremely good, which is why they are able to make it to the World Cup Rugby. The goal of these advertisements, I feel, are to spark humor, to create interest, and to build pride. By doing a series of ads, subscribers will notice the slight changes in this man’s appearance. Anyone that isn’t a subscriber, and only sees one ad, the point will still come across fairly successfully. The humor comes from seeing the man’s appearance change and him going from a straight face, to a big, toothless grin. The interest is developed based on the caption that The New Zealand Herald created. Then, the pride is based on both aspects of the humor and the interest. The objective is to make people interested in the World Cup Rugby and what the team is achieving. The target market of the ad is rugby fans and enthusiasts, New Zealanders, and anyone who enjoys a good competition. The ad strives to get people interested in the World Cup Rugby. To go the extra mile, one can argue that supporting the New Zealand team is the overall goal. Having pride in your country is one of the best feelings a person can have and, unfortunately, there isn’t enough of that anymore [not that many have been given enough reasons to be proud]. This ad is fairly straightforward and subtle. This is a mirror image of the same face, but there is one significant difference between the two. The one on the left has newsprint all throughout the skin. At first it looks like the newsprint from the other half of the paper transferred onto the face, but it is one hundred percent intentional. There is no text in the eyes or the lips, it is strictly just on the skin. The face on the right, though, is completely clear. In the bottom right corner of the ad, there is a little bottle of lotion, which is for Winter Creams. The concept of the ad is show that this lotion is great for getting your skin to a point of being completely clear and beautiful. The ad is wanting to create astonishment within the reader/viewer because of the distinct difference between the two faces. The objective of this campaign was to convince people that this lotion is great at removing unwanted aspects of your face, such as wrinkles or text. It is great at clearing up your face. The target market for this ad is anyone that desires to have greater skin. That, or someone who wishes to keep their skin looking great and wants to avoid it ever looking bad. The ad wants the viewer to consider purchasing this lotion in order to make their skin that much better. If the individual chooses to purchase and use this lotion, they will benefit by having better skin. By seeing the differences in the faces, it should motivate someone enough to purchase this lotion. This ad is referring to a time in World War II where troops were having to deal with horrible situations. When it came to storming the beaches, such as Omaha Beach, it was the worst place to be. So much so, the caption of the ad states, “AT 0630 ON JUNE 6, 1944, THE MEN OF THE 116TH DISCOVERED THAT HELL HAD COORDINATES.” There is an image of a soldier in the water, making his way to, what one can assume, is the shore. There is a description at the top of what all soldiers were facing that day at the beginning of the United States’ role during WWII. I feel that the purpose of this ad is to strike some fear and awe into the viewer/reader. No one should ever take lightly the sacrifices that were made all throughout WWII and never let the memory of those soldiers die out. The image itself is fairly frightful once you understand what exactly was going on that day in that exact image. Awe because of, honestly, the complete and utter amazement one should have when considering everything that those soldiers went through. I believe the target audience is for those who want to have an understanding of history. Or those do not know that the National D-Day Museum of New Orleans even exists. Or anyone that is an enthusiast and has an appreciation and understanding of what this country has gone through and wants to continue supporting the remembrance of that history. The ad wants the viewer to understand that there was nothing easy, simple, or fun about D-Day. The advertisement starts with stating, “Landmines are a very real danger for millions worldwide.” Then it proceeds to show video of explosions, survivors with prosthetics, recovery efforts made by individuals of landmines, all with a white outline of their country and their country’s name. It starts out slowly moving through each clip to jumping through them. Then it states, “If there was just one land mine in New York, the city would come to a standstill,” Marco Grob’. Then it jumps to a clip of New York City and segments of a gallery/museum space. So they set up a functional space with landmines throughout it and opened it up to the public. Made it “fun” by creating it to be an interactive environment where using (I believe) their phone [with an app] and wearing headphones is completely acceptable. They select the App ‘Sweeper’ and proceed to walk throughout the gallery space. As they walk about, when they get “on top of” a landmine, they hear an explosion through their headset and their screen goes white. Next, it shows them what exactly they have “stepped on” and greater details, such as how much it cost to arm the device and how much it would cost to disarm the device. The ad continues to show multiple individuals “detonating” different landmines and their reactions to each one and the information they read as the continue on. It shows peoples’ reactions as they realize that these sorts of landmines kill anyone and everyone. The last stated phrase is, “You are surrounded by landmines.” Then it proceeds to talk about a donation campaign where you text the word ‘DEMINE’ to the number 27722 in order to donate $5. “Help us rid the world of landmines and unexploded ordnance.” UNMAS is the acronym that is last seen before the commercial ends, which stands for United Nations Mine Action Service. The feeling of greater threat and concern over landmines throughout the world. Most people don’t think anything about there potentially being a landmine anywhere near them. At least, not in most of America. The issue is there are so many countries throughout the world that, due to so many wars, there are landmines left scattered all over the place and no one wants to do anything about them because, one, it’s dangerous, but the other issue is that it will cost a lot more money. The objective of this campaign was to raise awareness about this issue that so many other countries face and to help raise funds in order to help resolve these issues. This is another ad where I feel like it was striving for anyone that was willing to listen to what needed to be said and acknowledged. It is hard to make a difference or a change in the world if no one else knows about what you are trying to accomplish. Especially when it is on such a large scale. The ad wants listeners to care about this cause, enough to make a $5 donation to help remove landmines from countries throughout the world. What drives the viewer the most is knowing so much more and making it more personal by stating that, if there were a landmine in New York, that everything within the city would stop until that landmine was taken care of. This ad is more of shock in a depressing/frightening way. I guess scary would probably be the better word for it. The fact that it took such a drastic action by such a courageous group to prevent such a misstep in justice and law from happening, that is what terrifies me the most. The purpose of this ad is to show that, even in horrific times, the most drastic and creative ideas can make the greatest differences in the world. The purpose of this ad was to show a collective of everything that happened in this span of time where this change of law was potentially going on. Since this ad is after the fact of its subject matter, it isn’t specifically about the events that it is covering. It is about the idea that made the difference. It is about how having different ideas and acting upon them can be the best for the greater good. The idea of showing the country of Spain, and the world, what would happen if the law had been altered, by establishing an Abortion Travel Agency, that is a fairly radical idea, but it is deeply moving and significant. This ad starts with a parental advisory due to explicit language. Then it progresses with showing clips of small children saying some phrase or a slew of curse words that, one can assume, they have learned from a parent. The last child they show a clip of, after she says, “for f***s sake,” her father asks, “who taught you to say that?” and she smiles, points at him and says, “You.” Next, it changes to a white screen with text that says, “When you drive the wrong car you teach the wrong words.” Then a clip of an SUV and a small parking space, the driver stops really quick and says, “Aw for f***s sake,” and drives off. The next clip is a small, smart car successfully parking in a small space with no problem at all. The purpose of the ad was to, one, shock people with hearing small children say such “nasty” phrases that are viewed as extremely inappropriate for individuals their age to say. Two, there is a bit of humor to it because you cannot help but laugh when you hear some of them say what they have learned from the adults in their lives. Overall, though, the purpose of the ad was to convince drivers that, rather than dealing with the hassle of a larger vehicle and small parking spaces, get a smart forfour and avoid all of the frustration and prevent your children from learning “naughty” language. The target market for this ad, I feel, would be anyone old enough to drive and/or purchase a vehicle. They are obviously not advertising to young children, but trying to speak to the parents of the children to show them that, “hey, maybe you have had an incident like this where your child has suddenly said a word or phrase that they have heard you say in the heat of the moment, so avoid that happening again by purchasing this car we’re advertising.” They want the viewer to purchase a smart forfour and the gain from doing so will be your children not repeating your awful curse words whenever it comes to their mind. This advertisement starts by introducing Sophie Turner, probably around the age of seven) as the test driver. She starts off by describing the simple aspects of what she will be doing, “Left and right. Back and forward.” While she is talking, there are quick glimpses at the track that she will be driving through. She walks up the stairs of the stand (the safest place for her to be) surrounded by adults. Once at the top, she is handed a huge remote control, that resembles a controller for a remote controlled toy boat that could be used in a swimming pool, except much, much bigger. Then she proceeds to start moving her vehicle around the course, which is a huge dump truck style vehicle. Within a few seconds of her moving the truck, the front end is hit with a wooden crate that is being swung by a crane. Sophie pauses for a second but then continues on with her duty of testing this truck out. She grinds the axels and the undercarriage of this truck, drives over fireworks that explode underneath it, drives through a decent size pond, completely rolls the truck down a steep hill (somehow it lands back on its tires), and then runs it through a building that is partially constructed using cinder blocks. Plus, she finishes off by having the truck to donuts in a roundabout area. Surprisingly enough, the truck comes out in fine shape and in running condition, which was much to my amazement. Then the ad proceeds to talk about the Volvo FMX, saying it is the toughest truck they have ever made and it now has Automatic Traction Control. Plus, it then reassures viewers that this commercial was, indeed, done by professionals in a closed off area and the track had been completely cleared of all lifeforms before Sophie took to the controls and ran the truck through. I believe the purpose of this ad was to show just how tough this truck actually is and, what better way to prove that, than by having a small child drive this truck through, essentially, an obstacle course. Plus, they can show off the Automatic Traction Control with her driving through a pond and running donuts in a dirt lot. I think the shock factor was a fairly big aspect of this commercial. I can honestly say, as I watched it, my jaw sort of dropped because of everything that was happening to the truck. That and astonishment over how well it handled everything. The target market for this ad would be anyone needing a dump truck style vehicle that they will be putting through a lot of nonsense. So anyone in construction, rubble/waste removal, etc. Through this ad, they want the viewer to consider buying a Volvo FMX with Automatic Traction Control because it is a super tough vehicle that can handle just about anything that is thrown at it, even with a young child in control. The reason the viewer will be drawn to purchase this vehicle because of this ad is due to the fact that they can watch Sophie driving this truck and everything that she puts it through (whether that’s intentional or not). It reflects on just how tough the vehicle really is.